RT Bryan Bulaga, who has been one of the Packers’ best pass blockers over the last couple of seasons, attributed his rough first half on Monday night in Seattle to a lapse in fundamentals that took him out of his game. 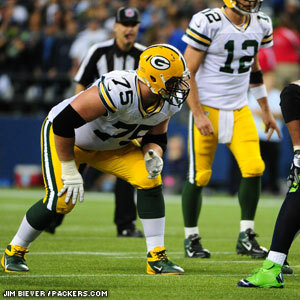 Bulaga surrendered two early sacks to Seahawks rookie rusher Bruce Irvin, a first-round draft pick, and allowed other pressures of QB Aaron Rodgers throughout the first half. 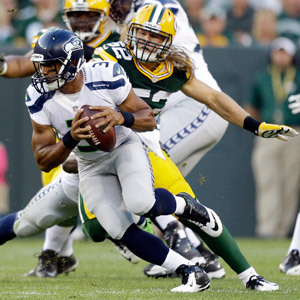 Rodgers was sacked eight times in all and the Packers were shut out at intermission. Bulaga is listed on the injury report this week with a knee injury and has been a limited participant in practice, but he said that had no bearing on his performance. Mike McCarthy said he expects Bulaga to “play through” the injury this week. Bulaga added that he didn’t get a fire-and-brimstone speech from position coach James Campen at halftime. The score was only 7-0, and a tirade probably would have caused everyone to lose focus on a winnable game. Plus, the performance was so out-of-character for Bulaga and his linemates that the problems were as much mental as anything. The Packers did that, putting together three straight scoring drives in the second half, helped by a commitment to running the ball, which they did successfully. The quick rebound has the linemen eagerly awaiting a return to the field Sunday against the Saints, both to continue that recovery and further erase the abysmal first half.